Gain a comprehensive understanding of the role that parents and families play in college students’ lives through their involvement starting with K–12, moving through the transition to college, and then focusing on the college experience itself. standards, models, and best practices that might be applied more broadly and modified as needed. As a whole, this volume offers an expanded way of thinking about how higher education understands, engages, and serves the needs of parents and families. This is the 6th issue of the 41st volume of the Jossey-Bass series ASHE Higher Education Report. Each monograph is the definitive analysis of a tough higher education issue, based on thorough research of pertinent literature and institutional experiences. Topics are identified by a national survey. Noted practitioners and scholars are then commissioned to write the reports, with experts providing critical reviews of each manuscript before publication. 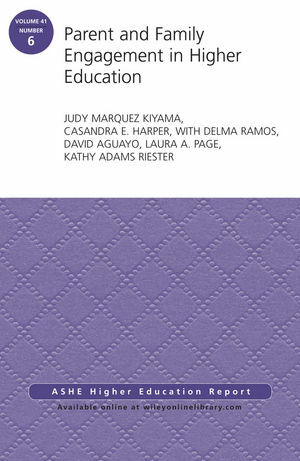 Judy Marquez Kiyama is an associate professor in the Higher Education Department at the University of Denver's Morgridge College of Education. Casandra E. Harper is an associate professor of higher education in the Educational Leadership and Policy Analysis Department at the University of Missouri.